Last Sunday two vans full of Connecticut Audubon Society members joined me for a day trip to northwest Connecticut in search of winter finches. 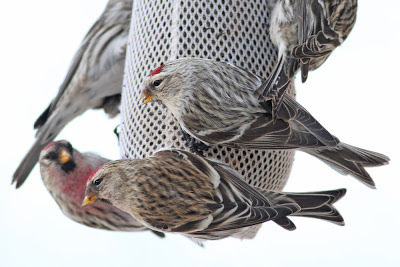 Redpolls stole the show as hoped for. We tallied several hundred Common Redpolls on the day which was a life bird for a few participants. Among the masses of Commons we were able to pick out at least two HOARY REDPOLLS, one of which gave prolonged views to everyone in the group. It happened to be the same individual that I photographed at this feeder a few weeks prior, pictured below next to a Common Redpoll. The Hoary took "bird of the day" honors and was a life bird for nearly everyone in the group.